This ex-FNM del Pacifico Alco PA-4 fell into disrepair before arriving at the Museum of the American Railroad. One of the recent Friends of the Flange articles described some individual locomotives that should have been saved, but somehow were not preserved. This post received decent circulation and discussion. A number of the commentators-- both online and in real life--brought up a very valid point: Some of the surviving examples of the first classes diesel locomotives have become perilously few in number. Not only was this was an enlightening comment, one fully worth exploring in its own article, it also brought up that so far, the articles on this blog have not examined the beginning of the diesel era in its own right. All previous entries have focused on what it did to steam and the people who specialized in that technology. This article--broken into two parts as it ended up being significantly longer than a normal post--will examine the history of early diesel locomotives, and then go on to look at the challenges in preserving the remaining members of the early classes produced for use on American railroads. The first attempts to develop an alternative to steam locomotives actually came quite early in railroad history. The earliest electric locomotives were put into service in the 1880s by railroads that had many tunnels along their routes or operated in densely populated areas. The pollution and exhaust gasses produced by steam locomotives were particularly undesirable in these situations. The electric locomotives were of this era drew their power from third rails or overhead lines. They could not, in other words, produce their own power, and were therefore very limited in their geographic range and required more infrastructure than a self-powered locomotive. The first real hints of the end of the steam era around the start of World War I. The type of warfare that evolved in this conflict was mechanized to a degree unseen in any previous conflict, and both sides relied heavily on their railroad networks to bring troops and supplies to the fronts. In some cases, the belligerent armies constructed narrow-gauge railroads in portable sections in order to move goods directly to the fighting. However, steam locomotives by their very nature presented a significant tactical disadvantage: Their noise and exhaust, especially in cold weather, gave the enemy very obvious clues about troop and material movements. To paraphrase an excellent science fiction website, there ain’t no stealth in steam. Petrol locomotive used by the British in WWI. During WWI, Britain and Germany both experimented with gasoline-powered locomotives. Around the same time, the General Electic company produced a few prototypical gasoline-electric locomotives for domestic use in the United States. These designs functioned well enough, though they could not at the time compete with the strength of a steam locomotive, and could not give the operators the same fine-tuned range of power deliveries as a throttle valve. As internal combustion engine technology developed in the early 20th century, gasoline engines proved to be better suited for applications where a relatively small amount of horsepower was needed, or where weight was at a premium. They are typically used in cars, small aircraft, and hand-operated machinery. Larger engines--heavy trucks, construction machinery, and some types of stationary generators--were more efficiently powered by a diesel engine, which differs most significantly in that the fuel is ignited by the heat of compressed air, not a separate spark plug. The diesel engine as we know it today was the work of a man named Rudolph Diesel. Born in 1858 in France to displaced German parents, Diesel showed an early aptitude for mechanical engineering and cut his teeth designing refrigerated factories. His own work with steam engines gave him a keen understanding of the significant amount of waste heat that an external combustion engine produces. In 1893, Diesel published a book that outlined his design for an improved internal combustion engine and partnered with Maschinenfabrik Augsburg-Nürnberg (known today as the MAN SE Company) to develop working prototypes. In 1913, Rudolph Diesel disappeared under somewhat mysterious circumstances from a ship crossing the English Channel. He did not live to see the type of engine and the fuel that came to bear his name develop into the backbone of the modern transportation sector. When referring to a diesel locomotive, it's technically more accurate to use the term diesel-electric locomotive, as the vehicle is essentially a small, mobile power plant. The diesel motor is not connected directly to the wheels, but instead powers an electrical generator that in turn feeds current to electric traction motors that actually turn the wheels. This arrangement was attempted without much success on a few prototypical steam locomotives, but was quite well adapted for use with an internal combustion engine. This diesel-electric was adapted to ship and submarine designs soon after Diesel published his designs, and used successfully in commercial and military maritime service by the early 20th century. Shrinking the mechanisms down to the size of a locomotive, though, took a few more decades of technological experimentation, and was further hampered when the Great Depression brought railroad haulage almost to a standstill and purchases of motive power almost completely ceased. The integration of diesel locomotives before WWII took place away from the public's eye: The technology was still in its infancy, and the few locomotives being produced had neither the power nor the mechanical stamina to stray away from switching yards and take commercial routes away from the steam locomotives that were at the very pinnacle of their technological development. What was to have a lasting impact on the railroad industry, though, was that the three largest steam locomotive manufacturers--Lima, Baldwin and Alco--all failed to transition into producing commercially viable diesel locomotives. Lima produced a few diesel powered switch engines, but put them on the market too late to remain commercially viable after as orders for steam locomotives tapered off, and merged with Baldwin in 1951. Baldwin, in turn, categorically refused to admit that the age of steam was coming to a close even though its sunset was plainly tinting the horizon, and failed to successfully market the diesel engines produced by some of its subsidiaries. Baldwin exited the market in 1956. 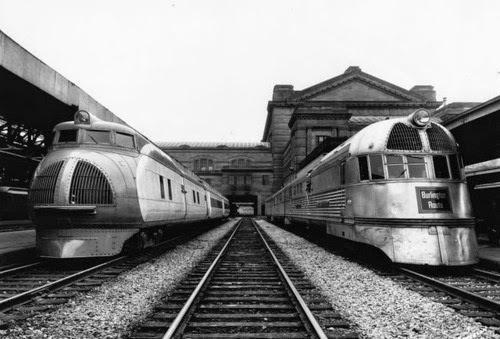 Alco experimented with diesel locomotives early and produced the most commercially viable and recognizable designs out of “The other Big Three,” but was on the loosing end of too many corporate partnerships and government contracts to compete in the long term. 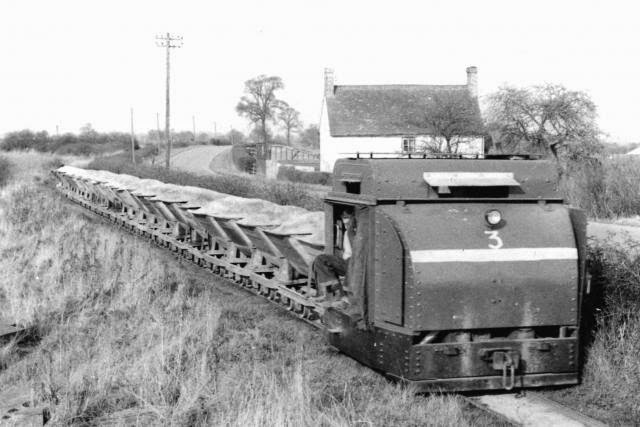 Alco gradually ceased producing locomotives in the 1960s and folded entirely in 1969. Two companies came to dominate the diesel locomotive market in the mid 20th century and, for the most part, still hold onto that position today. General Motors, the automobile manufacturer, anticipated a market for diesel locomotives and acquired several smaller companies which owned facilities capable of producing engines of that size. These were conglomerated into the Electro-Motive Division, or EMD. General Motors retained ownership of EMD until selling the company to a subsidiary of Caterpillar, Inc, which slightly tweaked the acronym to stand for Electro-Motive Diesel at the time of the sale. EMD earned its place in the industry when it produced the diesel engine for the Burlington Zephyr. The technological success and high publicity of that engine resulted in several more orders pouring into EMD. The company soon began to design and produce entire locomotives, and perfected the technology that allowed several diesel units to be linked together as operated as one engine--one of their biggest advantages over steam locomotives. The second company to enter into production of modern locomotives was General Electric. GE had produced a few locomotives of their own early in the 20th century, but hesitated to enter the market in any real way due to a longstanding partnership with Alco. GE began to produce its own locomotives in earnest as Alco slid into bankruptcy in the 1950s, and today has overtaken EMD as the preeminent producer of locomotives. Both companies took a markedly different approach to building and marketing locomotives than their predecessors. Steam locomotives were mostly designed to the needs of the railroads on which the would run. The breathtaking variety of designs resulted from a myriad of technological concessions to fuel sources, cargo, and geographic peculiarities where the engine would be running. EMD turned this on its head and produced and marketed locomotives in the same way as they did cars: A few basic models not customizable to the wishes of the buyer, sorted according to whether they were designed for freight haulage, road switching, or yard work. By this time, passenger service was visibly flailing in its death throes, and there were far fewer types of locomotives produced specifically with passenger service in mind than in the days of steam. The classes of locomotives produced roughly between 1940-1965 are what we will for the purposes of this article refer to as the “first generation" of diesel locomotives. They are not the oldest, but they were the first to be mass produced and put to work on railroads in large numbers. In other words, they were the first classes that were reliable and powerful enough to successfully challenge the longstanding reign of steam locomotives. In Part 2 of this article, we’ll go back and look at some of the most successful first generation diesel locomotives, and then go on to discuss why preservation of those models has been more difficult than it might seem.